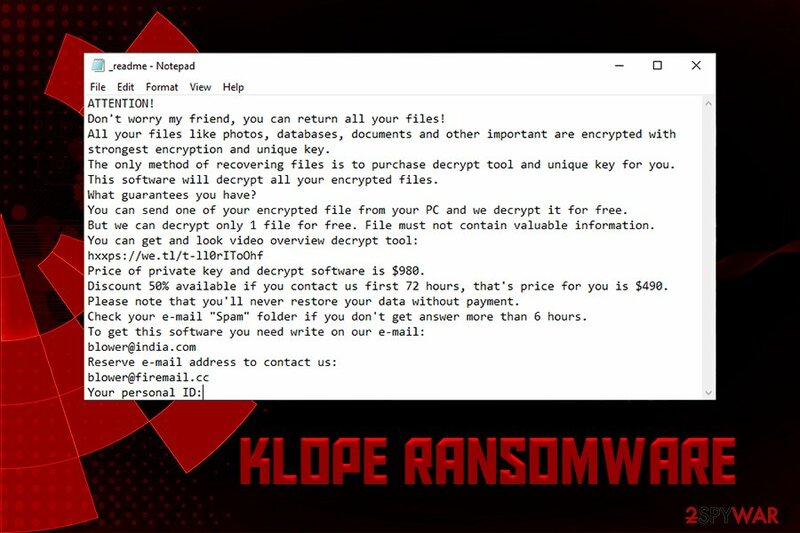 Klope is a ransomware-type virus that was first spotted in the wild in mid-March 2019. The threat comes from the STOP/Djvu virus family that has been one of the most dominant malware strings in the past year. In most cases, users get infected when they download pirated software or its cracks via third-party sites, although infiltration is also possible via other means, such as exploit kits, spam emails, etc. 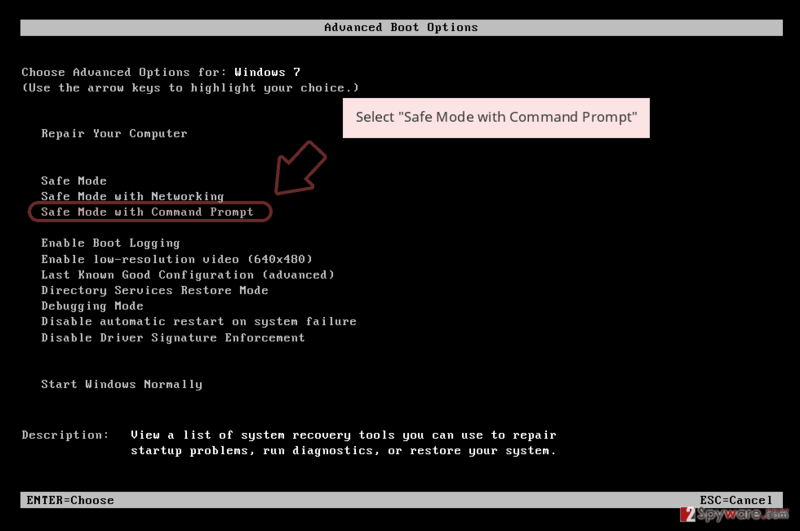 Once inside, Klope file virus performs a variety of changes to the Windows operating system to execute the file encryption procedure without interruptions. This process also appends .klope extension to photos, videos, documents and other files, which prevents users from opening any of them. At this point, malware contacts Command & Control server which stores the unique key for data decoding and also drops a ransom note _readme.txt. According to hackers, users need to email them via blower@india.com or blower@firemail.cc and pay $980 ransom. However, victims should never contact threat actors and instead focus on Klope ransomware removal. Infection means Sites that host pirated software, spam emails, unprotected RDP, etc. strongest encryption and unique key. As evident, attackers responsible Klope ransomware are trying to convince users that there is no other way of recovering personal files but paying them $980 in Bitcoin. Unfortunately, but there is no decryptor for this version of the virus created yet. The unique key is stored on a C&C server that is controlled by hackers, and only they have access to it. This is how bad actors are trying to manipulate users into paying ransom for Klope virus decryption tool. While it is true that retrieving files locked by Klope ransomware are minimal (because malware removes Shadow Volume Copies), you should not pay hackers. First of all, you would be proving them that their illegal business is working, and would only encourage them to create more sophisticated viruses. Secondly, ransomware developers are known to ignore the victims even after the payment is made. Therefore, you might lose $980 (or $490) along with your files. Thus, rather remove Klope ransomware with the help of anti-malware software that can recognize the threat. Be aware that different vendors use separate databases, so a scan of several different tools might be needed. 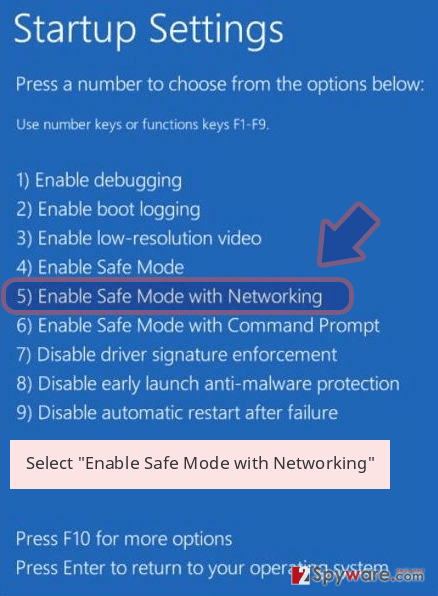 You might have to enter Safe Mode with Networking if Klope virus is tampering with security software operation. After that, you can attempt to recover your data locked by .klope file virus (be aware that this is important, as in the reverse scenario all the recovered files would be encrypted the repeatedly) – you can do that with the help of our instructions below. To complete full recovery, you should also scan your device with Reimage. Download sites that offer allegedly free software are extremely popular, as users keep on downloading something they should be paying for otherwise for free. Of course, it is illegal to do so, but people are still willing to risk running into law enforcement and also malware infections. Therefore, experts highly advise staying away from high-risk sites that offer cracks, keygens or pirated software. If you still decide to download high-risk files like that, you should at least scan them with tools like Virus Total. However, be aware that tools like cracks will most likely be flagged as malicious regardless if it actually is. This happens due to the core functionality of a hacking mechanism. When installing new software, make sure you pick Advanced/Custom mode so you can remove unwanted apps before they enter. To remove Klope ransomware from your computer, you will have to employ reputable security application. However, be aware that AV engines use different databases when it comes to malware detection, so not all of the tools can recognize Klope virus. We suggest trying Malwarebytes MalwarebytesCombo Cleaner or another powerful tool. 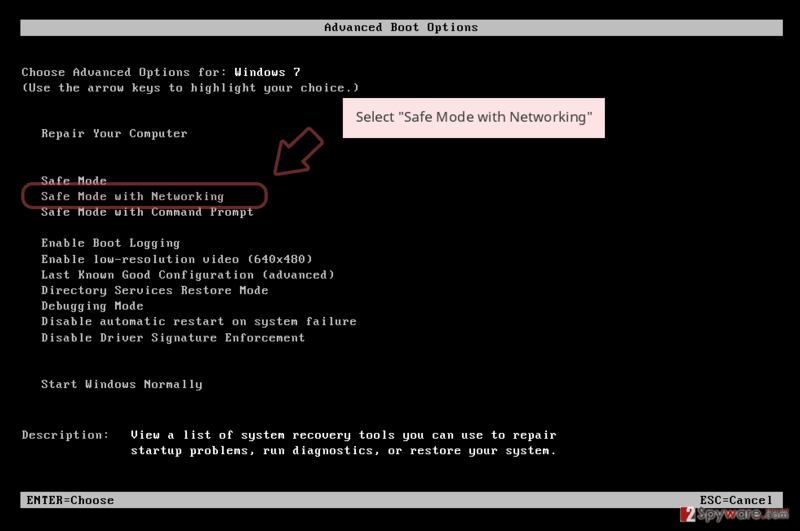 Additionally, you might have to enter Safe Mode with Networking if the infection is tampering with security software. We explain how to do that below. Once you complete Klope ransomware removal, you can explore the file recovery options. If you had backups prepared, you should have no problems of restoring all of your files. In another case, try using third-party recovery tools, although chances of a positive outcome are relatively low. Nevertheless, remember that security experts continually work on decryptors for STOP virus versions. Log in to your infected account and start the browser. Download Reimage or other legitimate anti-spyware program. Update it before a full system scan and remove malicious files that belong to your ransomware and complete Klope removal. 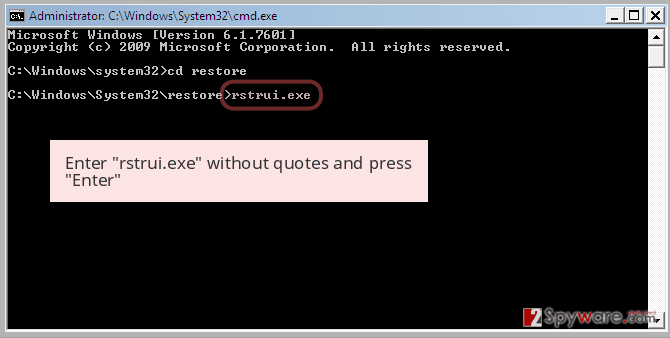 When a new window shows up, click Next and select your restore point that is prior the infiltration of Klope. After doing that, click Next. 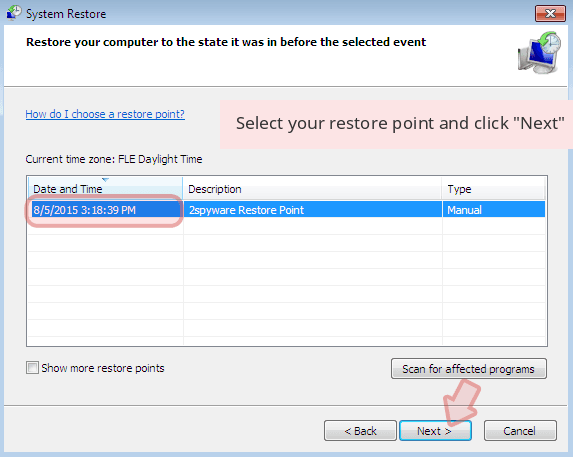 Once you restore your system to a previous date, download and scan your computer with Reimage and make sure that Klope removal is performed successfully. 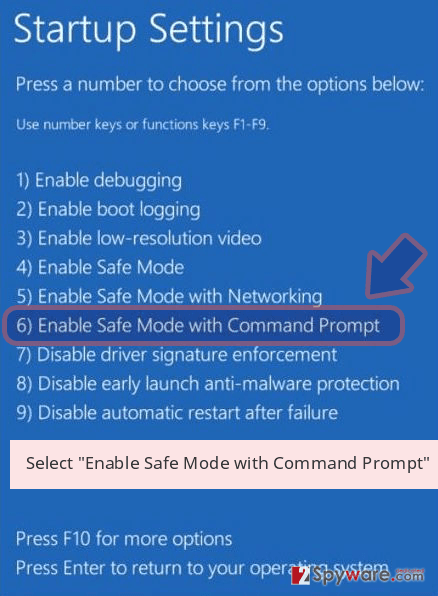 Guide which is presented above is supposed to help you remove Klope from your computer. To recover your encrypted files, we recommend using a detailed guide prepared by 2-spyware.com security experts. This tool might be able to restore some of your data, so make sure you try it. 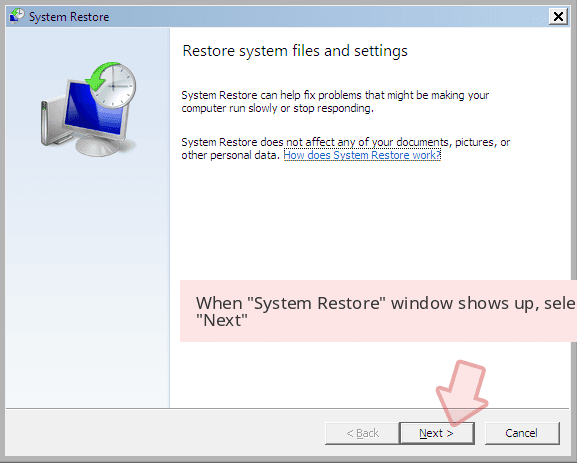 If you had System Restore enabled before the ransomware infected your computer, make sure you try using Windows Previous Versions feature. ^ Michael Gillespie. #STOP #Djvu #Ransomware. Twitter. Social network. ^ Exploit kit. Wikipedia. The Free Encyclopedia. ^ Lesvirus. Lesvirus. Cybersecurity researchers. This entry was posted on 2019-03-28 at 12:24 and is filed under Ransomware, Viruses. You can quickly scan the QR code with your mobile device and have Klope ransomware manual removal instructions right in your pocket. How did you remove Klope virus?